When should you install a fixed guard as opposed to an interlocked guard? Is a bolted guard a permanent fixed guard? When is it acceptable to replace physical guards with light curtains? These are common questions people have when selecting the appropriate guarding for their machinery. Guidance on selecting the appropriate guard is available in the Work Health and Safety legislation, section 4 of the Code of Practice, "Managing the Risks of Plant in the Workplace" explains this process. This is based on clause 208 of the Work Health and Safety Regulations (Current legislation for all states and territories except for WA and Victoria). If access to the area of the machine is not needed during operation, maintenance or cleaning then a permanent fixed safe guard is required. What is a permanent fixed safe guard? The code of practice states this guard is welded or incorporated into the body of the machine, thus a bolted guard is not a permanent fixed safe guard. If access to the area of the machine is require during operation, maintenance or cleaning then an interlocked guard can be used. 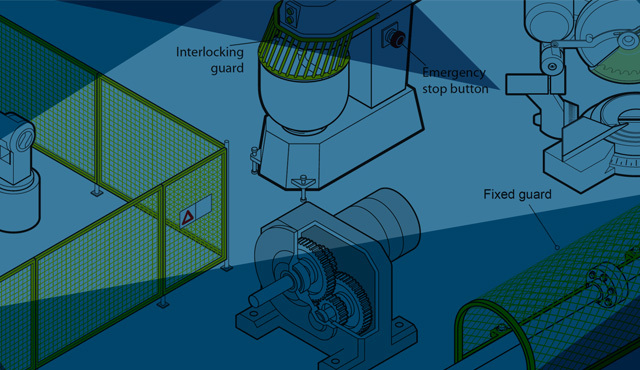 This guard will have a safety control system that will cease any relevant hazardous energy to the machine when the safe guard is not in a closed position. If it's not reasonable to use a permanent fixed safe guard or interlocked safe guard then a fixed safe guard can be used. A fixed safe guard can be removed and replaced with the aid of a special tool, such as a coded spanner or Allen key. Thus a bolted guard would be classed as a fixed safe guard. If none of the above physical guarding options are practicable, then a presence sensing system, such as light curtains or laser scanners can be used. A common example of this would be a conveyor that transports goods into a robotic cell, if a physical guard was used then the goods would be blocked in entering the cell whereas a light curtain will allow the goods to enter the cell in a safe manner. The most common query people have about the above guidance is: When should I use an Interlocked Guard or a Fixed Guard? People performing the task - For access through a fixed guard the operator must be trained on the isolation procedure of the machine, this training must be refreshed and documented. If this knowledge can't be relied on then an interlocked guard should be used. Australia Risk Services have close to 20 years experience in designing safety management systems. We offer safety systems that identify and seek to remedy safety, environment, and health risks in the workplace.